Please join the Center for African American Studies for the November Power Hour Lecture. The guest speaker is Michael Shawn, co-host of K104's popular radio show, DeDe in the Morning. 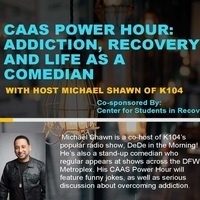 Mr. Shawn will be discussing overcoming addiction. This is a power hour lecture you do not want to miss.